We’ve reached 7000 Facebook Likes ! some solid Nates Car Sales family behind us 😁. Once again to all those who buy cars from us, who sells cars to us, who sends customers to us, any one that supports us in anyway we thank you! We are truly humbled and blessed to have all of you in our lifes.. Many Blessings upon you all! 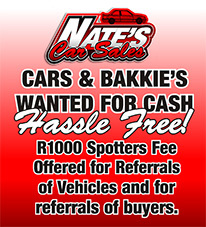 Bring your car for an appraisal. Congratulations to Lindsay Viljoen for guessing the correct vehicle all the way from Cape Town! !